The GPS lamp will turn red if no signal, and blue if receiving signal. GPS connection may take a couple of seconds to several minutes, depending on where the vehicle is. Setting this is a configurable item. Connection or disconnection of the optional camera with main unit will reboot the system automatically to initialize 1ch or 2ch recording mode. When an impact is registered, the program records 10 seconds prior to the impact and 15~60 seconds after the impact (adjustable in the configuration) as an (EVENT) file. Memory size allocation between (EVENT) folder and the (NORMAL) folder can be adjusted in the configuration settings. Main camera image shows when system starts. Rear camera image shows on the screen at the first click on the “V” button. LCD turns off at the 2nd click on the “V” button. !! Note : Operate the system while the car is securely stopped for your safety. [PLAY] button starts the latest videos files. [VIEW] button changes the videos according to time sequences. Date and time data are displayed on the bottom of LCD. the [PLAY] button. It can enlarge x2, x4 times and return to original size. Pressing [PLAY] button for more than 3 seconds will make the system return to recording mode followed by an announcement of current audio recording status. ”Auto Parking” option is selected as a default setting and it automatically places the unit in the“Parking Mode” once the car does not move for longer than 10 minutes after the last driving mode recording. 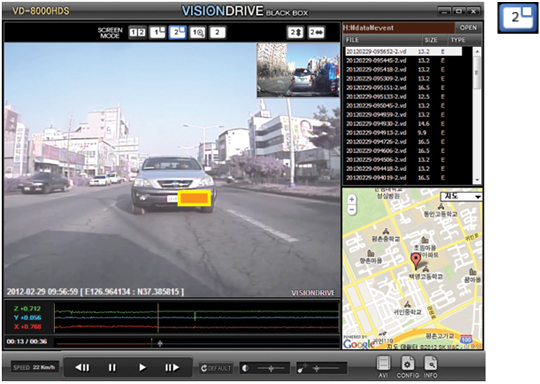 The unit will automatically turn back to “Driving Mode” once the unit registers movement. If “Auto Parking” mode is not selected, “Parking Mode” recording can be activated when you press and hold the [PLAY] button for more than 3 seconds. When the system commences parking mode, a voice notification will be announced that the parking mode has been initiated. When the ”Auto Parking” option is selected, “Parking Mode” controlled by pressing the [PLAY] button will not work. Once in Parking Mode, the system automatically rearranges its impact sensing sensitivity to the most sensitive in order to register slight impact. 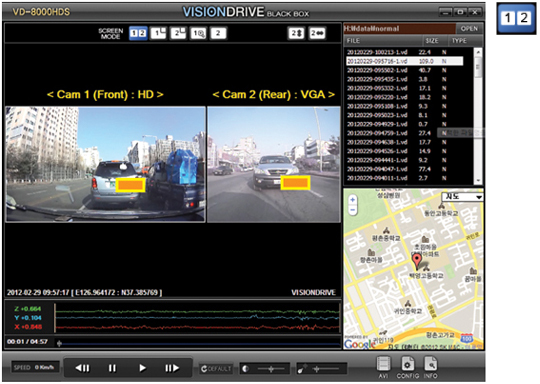 While there is no impact, the system records 4 frames/sec to save the SD card space and returns to normal full frame recording mode making an EVENT file when it detects an impact to the car. After making an EVENT file, it returns to 4 frame recording mode again. In parking mode, the system repeats the announcement of “Parking Mode is on” every 2 minutes. No audio is recorded while parking mode is on. In parking mode, the system repeatsthe announcement of “Parking Mode is on” every 2 minutes. 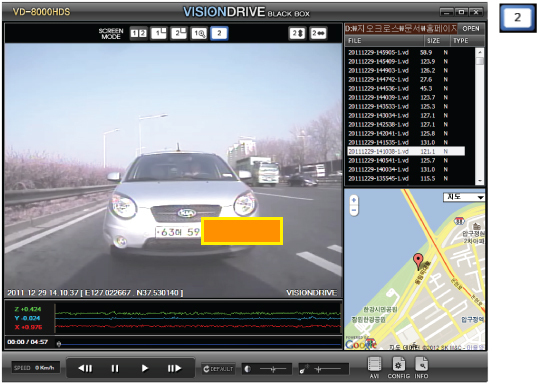 To return to normal (driving) recording mode, press and hold the [PLAY] button for more than 3 seconds to hear the “Driving Mode on” announcement or allow the unit to detect self-movement and return to normal mode. To use the parking mode, the product has to be connected to the power source directly. In regards to direct wiring to the vehicle’s power source, we recommend using professional help. Extensive and continuous use of the vehicle’s power source may exhaust the performance of the product. The company is not liable for the damages from continuous use of the product more than 24 hours. We recommend the full power to be off after use of 2~3 days in order to maintain the product longer. When the [SHOT] button is pressed and held for more than 3seconds, the voice notification will announce that the voice recording has been enabled/disabled and the voice recording will either start or stop depending on the previous audio recording state. Users are recommended to use the SD card issued by the manufacturer. The SD cards contain necessary programs to operate the product. 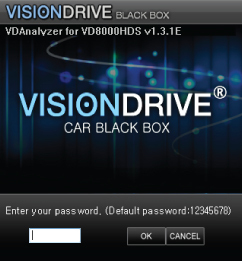 Also, the provided SD card is tested and certified by the manufacturer while other SD cards may not match the performance and specifications that authentic VisionDrive® SD cards can offer. SD card readers can be purchased at computer accessory stores. This product is programmed to automatically check and reboot the system, if the product is in a non-functional status. By rebooting the system, the product notifies the user that such action is taking place. Open the VDAnalyzer.exe program, then password window will be displayed. When a file chosen is selected from the list , the screen shows the first frame of the file for your easier choice of reference. A double-click on the a selected file in the list plays the video on the screen. 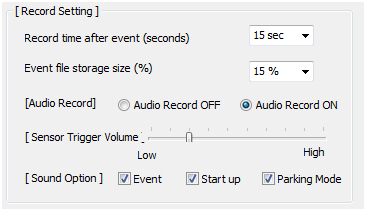 After you double-click a file, the later recordings will automatically and continuously play one after another. However, the (EVENT) to (NORMAL) folders are not successive in playing. Each folder has to be opened separately. Front view (Camera1) and Rear view (Camera2). Big screen for Camera 1 and sub screen for camera 2. Big screen for Camera 2 and sub screen for camera 1. One big screen for Camera 1 only. One big screen for Camera 2 only. Screen upside down function : camera 2 screen can be switched upside down by clicking the button. 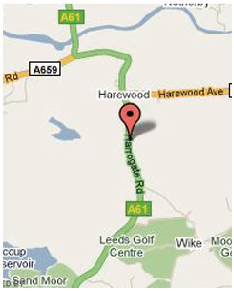 The Google map is viewable only while your PC is connected to the Internet and only when the recorded video has GPS data associated with it. The red line is before the impact (that triggered the event), the blue line is the time after impact. When you press the pause button, viewing video will be paused. Brightness bar can give you better video analysis by changing the video brightness while playing on PC. 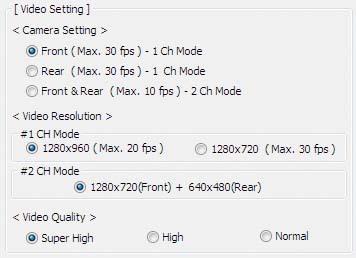 Sharpness bar can give you better video analysis by changing the video sharpness while playing on PC. This function may cause delayed video playback. It always keeps the original image no matter what is done with it. The data files in the SD card are product files and will only work within the Viewer Analyzer program. To view the data on a regular PC without having the Viewer Analyzer program within the SD card, the recorded file has to be converted to an AVI file. Pause the file where you want the conversion to take place on the previewing file display. Press the AVI conversion button on the bottom right side, and then a window will pop up to have the file renamed. 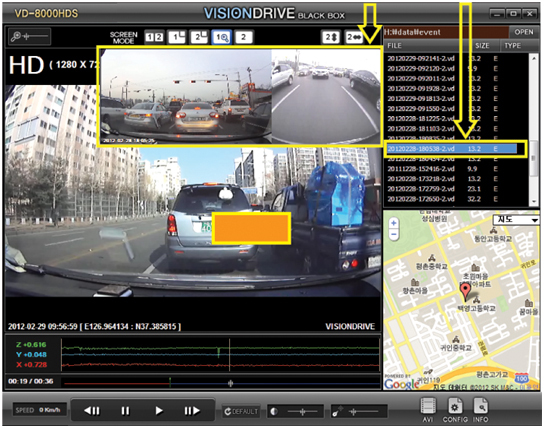 When making an AVI conversion, you can select your options of Audio/GPS/Date & Time/Vehicle Information, Speed to be included in the .avi file as overlays to the video. Press the play button again, and then the data being previewed will be converted from the point you specified or previously paused at. Pressing the pause button while the conversion is in progress, will stop the conversion at that time. If the necessary codec is not available to convert the data into an AVI format file, it may not work on your PC or a notification will pop up saying you may need to download a specific codec to proceed. In such cases, use the supplied Xvid-1.2.1-0412008.exe(on the SD card) to install the needed codec, then restart the Viewer Analyzer program to proceed again. If the codec is already installed on the PC, there may be some difficulties if the codec is installed twice. So unless there is a notification for installing a codec, do not install it. Forward resolution can be set only in 1CH mode. If the resolution is high, the file size also becomes large and will use more memory on the SD card. The sensor can be configured. If the number is larger on the sensor, the sensor becomes less sensitive. A setting of 10 will disable the Shock Sensor Event recording feature. Impact files are stored in the EVENT Folder and the size of the EVENT Folder is defined here. There remaining % of the SD card space is for the NORMAL Folder. 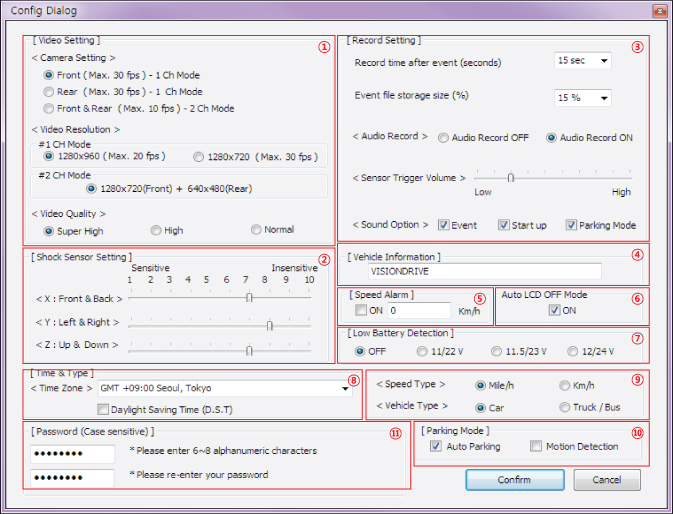 Audio recording is selectable here but regardless of this setting, you can immediately change the audio recording status by pushing the SHOT button on the main unit as described earlier in this manual. Impact sound volume can be modified. Each of the Sound Options can be configured: Event (Alarm) / Start up (Greeting) / Parking Mode(Notice) to either enable or disable the sound. The volume of these announcements is also configurable. You can type in your car or other information, which will be shown in the video during playback and can be included with the exported AVI video (if selected during export). When set to a defined number, the system will alert you to over speeding when that speed is exceeded. -	If “Auto LCD Off” option is selected, the LCD of the unit turns off automatically 3 minutes after your unit has started. You can select whether to use car battery drain monitoring function and what the supply voltage is as part of that monitoring process. The recorder will shut down when it detects that the supply voltage is lower than the setting selected here to save vehicle battery power. You can select your location and time zone. then, the GPS will register your local time in your video. You can select your local speed type as Km/h or Mile/h. You can also select your vehicle type as Car or Truck/Bus and this assists in calibrating the 3 axes shock sensors for angled or vertical windscreen installation. 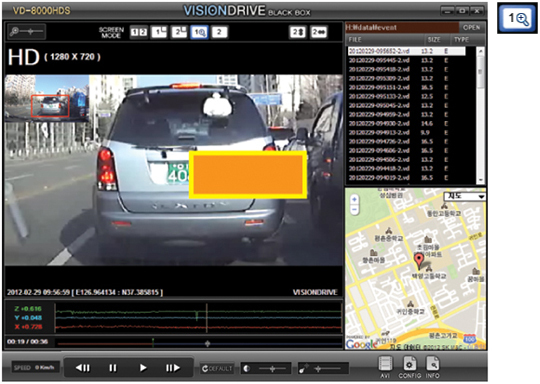 If “Motion Detection” option is selected, the unit will detect a motion outside the car and will register it as an “impact” and record it as an “Impact” file in the Event folder. 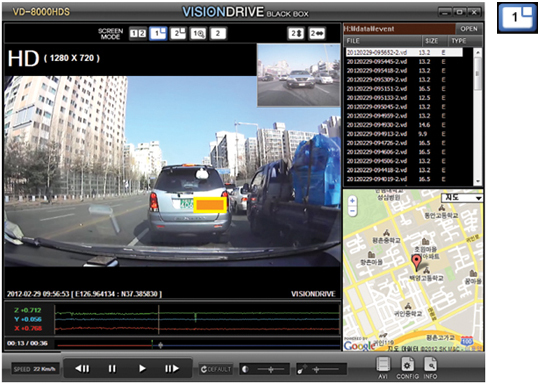 “Motion Detection” mode is available only while the “Parking Mode” is running (not applicable during driving record mode) and the Motion Detection feature only uses the main unit camera for motion detection and not the optional second camera.